The smile of your dreams can be yours with porcelain veneers. Porcelain is a beautiful restorative material. It can perfectly mimic the appearance of natural tooth structure in color, in translucency, and in surface texture. Additionally, it will not wear, deteriorate, or discolor if it is properly maintained, and it is harder than natural tooth enamel. 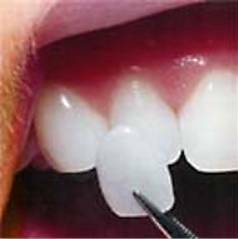 Gaps Between Teeth: If you have small gaps between your teeth, porcelain veneers can make your teeth look larger. Misshapen Teeth: We will ensure that your veneers are perfectly shaped to enhance your smile. If you have teeth that are too thin or short, a veneer will provide a more pleasing shape. Chips: The application of a porcelain veneer over the chipped edges of a tooth can make the appearance natural and flawless. Tooth Discoloration: For tooth discoloration, veneers can mask that color with whatever shade you desire. After the smile design that would be appropriate for your case has been discussed and you have selected the design you want and the color you want, the next step is to prepare your teeth. There may be some shaping of the teeth, if they are out of alignment. Usually a slight finish line needs to be created so that when the porcelain is applied over your teeth, the end result will be a seamless transition from tooth to porcelain. The photograph at the right shows a porcelain veneer being held over a prepared tooth. It is difficult to see, but there is a slight amount of tooth structure that has been shaved away, and a small lip is present on the tooth. The veneer fits right into the prepared area so that the final result looks exactly like a tooth with no unnatural bumps or extra thickness. The picture also shows how thin the porcelain veneer is. It is about 0.5 millimeter thick, about the thickness of a fingernail. When the new veneers are recieved back from the laboratory, they will be tried on to make sure they fully meet your expectations. Once you indicate that you love how your new smile looks, Dr. Smigielski will bond them to your teeth with a powerful resin. When the application process is complete the veneers will be seamlessly shaped and their appearance will be almost undetectable. No one will ever know that you are wearing veneers. You will absolutely love your new smile!